▲ It’s been 25 years since my first visit to Angkor Wat and things have certainly changed. 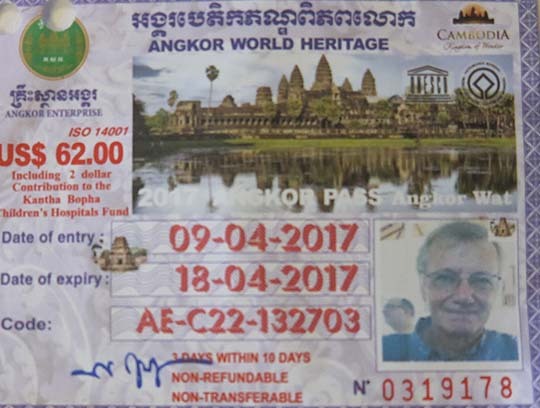 For one thing you didn’t pay US$62 for a three day pass to visit the Angkor ruins back in 1992. ◄ On that occasion there were probably more straggling Pathet Lao troublemakers than tourists at Angkor Wat. 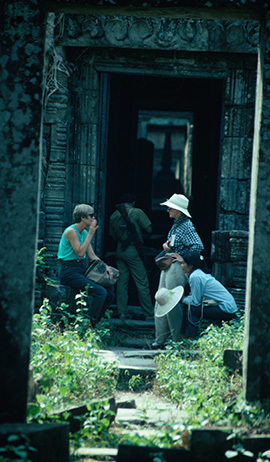 When we visited Preah Khan you can see the armed guard Maureen (in blue on the left) and I had to take with us. 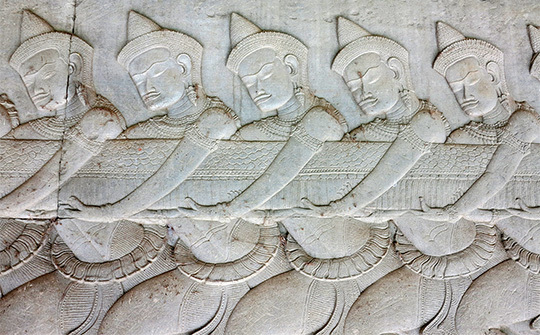 ▲ Visiting Preah Khan on this trip I particularly wanted to see the Hall of Dancers. Today we have a Robert Powell original based on the apsaras who dance across the door lintels. 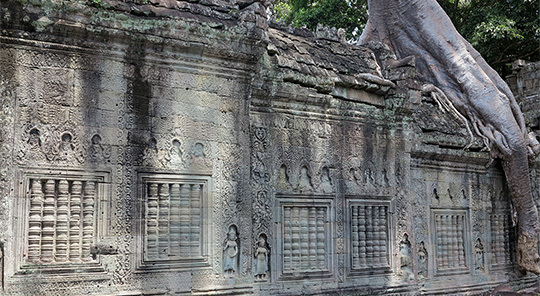 ▲ Preah Khan also has those hallmarks of an interesting Angkor temple, wonderful bas reliefs and, at some temples, an ongoing wrestling match with the jungle vegetation. ▲ Of course I went back to the Bayon and, of course, those enigmatic faces are as enigmatic as ever. ▲ At Angkor Wat itself restoration of the bas relief illustrating the Hindu legend of the Churning of the Ocean of Milk was completed in 2012 and looks simply wonderful. Demons and gods compete in a tug-of-war with the serpent Vasuki, coiled around Mt Mandala, which churns the sea and extracts the elixir of immortality. 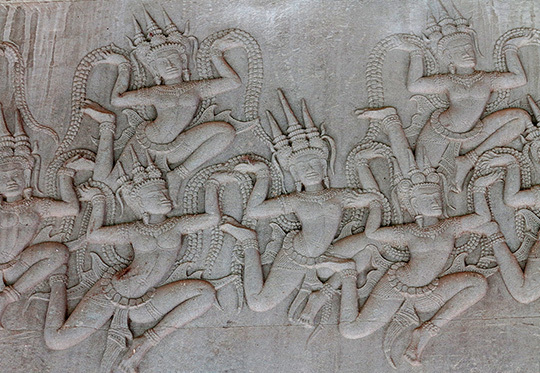 ▲ Overhead apsaras dance encouragement, much as they danced in Preah Khan’s Hall of Dancers. 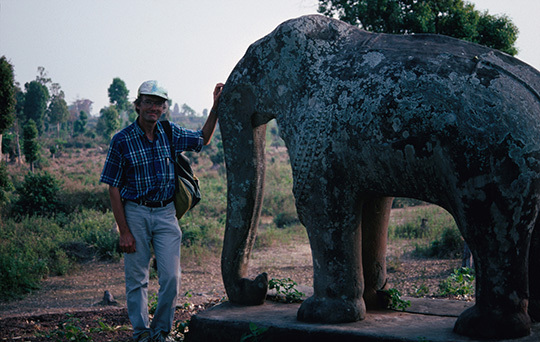 ▲ In 1992 I stood by one of the elephants at the East Mebon temple. 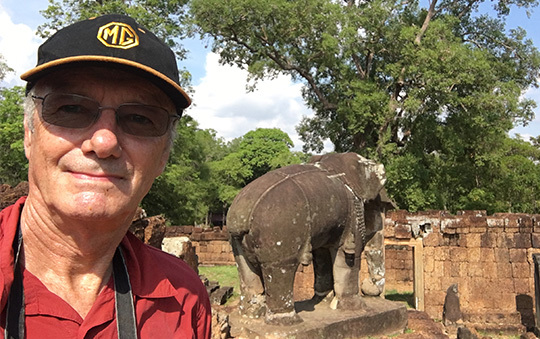 ▲ And I returned for a selfie with those same elephants in 2017, although today they’re on a terrace whereas my 1992 photo seems to show them at ground level? ▲ As well as sunrise at Angkor Wat on this trip I also caught sunset at the floating village of Chong Kneas.